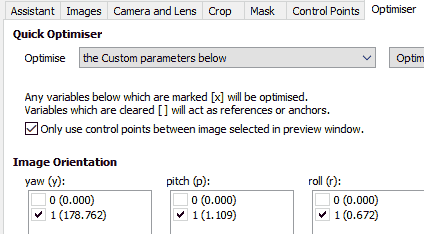 Converting the raw video from the Ricoh Theta SC requires knowing the lens parameters. Since Ricoh doesn't publish those, I set out to find them. Projection - resampling the image into a format that the panorama viewer can accept. 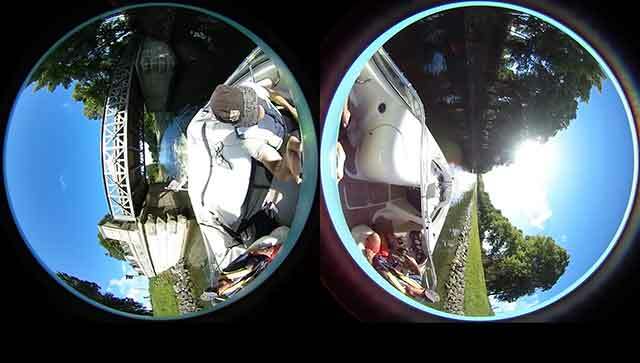 Alignment - correcting for imperfections in the dual-lens alignment. Nadir correction - The camera captures a bit of itself at the nadir point, where the overlap between the hemispheres is zero. This can be fixed by distorting the image slightly as you approach nadir. Blending - In the presence of strong light sources the two cameras may get lens flares or other artifacts that makes a simple blend show strong seams (see below). The projection parameters are quite straightforward. It suffers from a lens flare in the front hemisphere that probably should be smoothed out, but otherwise things line up.